Broke his leg playing football in college. Had two sons, and four grandchildren. The eldest son died of scarlet fever in 1921, but the second son married and had four children. His grandson David married Julie Nixon, the daughter of Dwight’s vice president, Richard Nixon. He married Mamie Doud on July 1st, 1916. 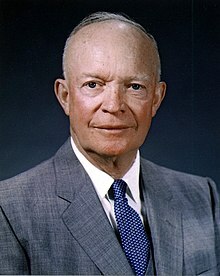 Became the 34th president of the United States on January 20th, 1953. Stepped down from office after two terms of four years, on January 20th, 1961. Died on March 28th, 1969, at the age of 78.